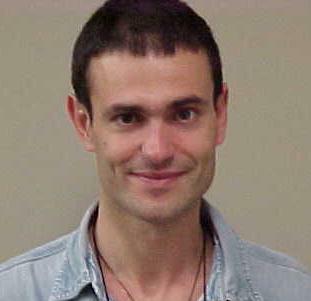 Giuseppe Pagnoni of Emory University (pictured) is doing fMRI studies of zazen (newspaper article ), comparing 15 experienced meditators and 15 controls, with a focus on attention and inhibition. Pagnoni has also done neuroimaging studies of social interaction. According to the newspaper article, Pagnoni is taking a more experimental approach than usually seen. Instead of simply looking at meditators’ brains and seeing what parts “light up”, he actually plans to put neurologically damaged subjects through a meditation training program so he can compare them to people with normal brain functioning. This is the kind of experiment we need many more of. Brad Warner recently wrote about participating in this study (blog entry). Apparently Pagnoni is doing EEGs on meditators after having them do some cognitive exercises, followed by fMRI scans the following day involving the subject entering a meditative states and “doing some weird computer tasks”. The combination of EEG and fMRI sounds potentially fruitful. But how can you do mental exercises while “in a meditative state”? This entry was posted on Thursday, May 4th, 2006 at 09:27	and is filed under neurotheology. You can follow any responses to this entry through the RSS 2.0 feed. You can skip to the end and leave a response. Pinging is currently not allowed. hi, bob. the closing question in your text is a bit weird. i’m not sure they’re doing the exercises while in a meditative state, but even then, there are many meditative states in which one can perform various activities, including complex mental operations and intricate physical movements – all simultaneously. indeed, vajrayana meditations in tibet and japan are constructed essentially to merge the two – absolute unmoving witness and relative phenomena in a nondual union. the relative stillness of early meditative development inhibiting thought, or, differently seen, disrupted by thought, is essentially just a stage and definitely not something to equate as the meditative state. however, still many people equate meditation with non-discursiveness which is a rather narrow view. i’m sure your point was well-intended. :-) thanks for your article.